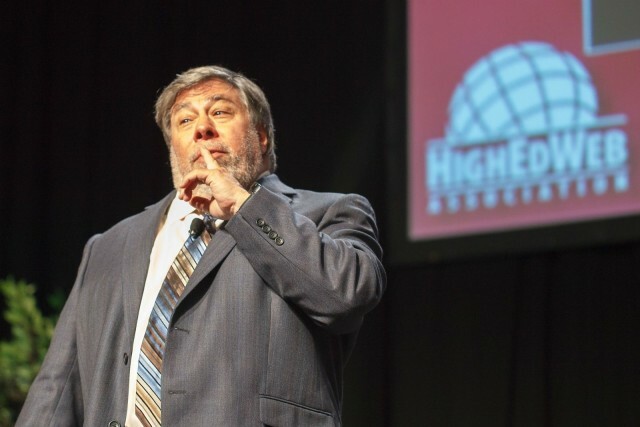 Steve Wozniak, one of Apple’s co-founders, does not yet own the company’s recently released smartwatch. “They haven’t shipped it yet,” he said in a recent interview that also covers his thoughts on artificial intelligence, driverless cars, and Segways. Wozniak is attending hardware and software developer Freescale’s annual Technology Forum this week in Austin, Texas. During an on-stage talk with John Dixon, the company’s director of corporate marketing, he took a moment to share his thoughts on Apple’s new wearable. Wozniak has apparently gotten that discount sorted out, however, and has placed his order. But he doesn’t have the Watch just yet. And while he’s a little short on first-hand experience right now, he does have a few opinions to share about the product. As for the model, it sounds like Wozniak really wanted to spring for the $1,100 42mm stainless-steel version with the black link bracelet. But he might have gone for the leather loop instead (the interview only says that he got “one that was $400 less expensive”). Once Wozniak has his Apple Watch, it sounds like it will be bad news for his wife; the engineer claims that his sole use of the Internet of Things has been pranks. “Let’s see, it’s 4 a.m. in California,” he offered as an example, “I’ll honk the horn in the garage.” Having a shenanigan-ready device strapped to his wrist will only make these kinds of jokes easier. Sorry, Mrs. Wozniak. Maybe you should try to intercept UPS.